I’m not a fan of licorice or anything that remotely resembles the flavor. Thus, fennel and anything anise are pretty much a no-go. Absinthe, depending on the brand, varies a lot in flavor but is always reminiscent of licorice. Of the few times that I have had it, I have not been a fan. I also did not have any magical or maniacal experiences while drinking it. That being said, I do still enjoy the ideas, history, and urban myths surrounding the drink. While pondering my life, which isn’t uncommon for me, I thought about an absinthe bar and whether or not this would be successful. I’ve come to the conclusion that, if branded correctly, it could be a successful establishment with the same vibe as a hookah bar. Relaxed, trendy, social. After sketching this out, I realized that you could not give customers an absinthe spoon, as they would likely steal them often. I also realize that i mistakenly colored the absinthe fountain GREEN, which is not correct. Having the absinthe fountains (filled with water, if you don’t know), on each table is feasible, but a bit dangerous around drunk people. I would rather not have to pay for a new absinthe fountain each week. A variety of absinthe cocktails, and absinthe or absente drinks would likely always be accompanied with a lesson on the difference between the drinks and a history of la fee verte. For an added touch, bartenders should be in Victorian garb. I also thought an art/crafting room would feel appropriate and help support the stereotype of the drink. 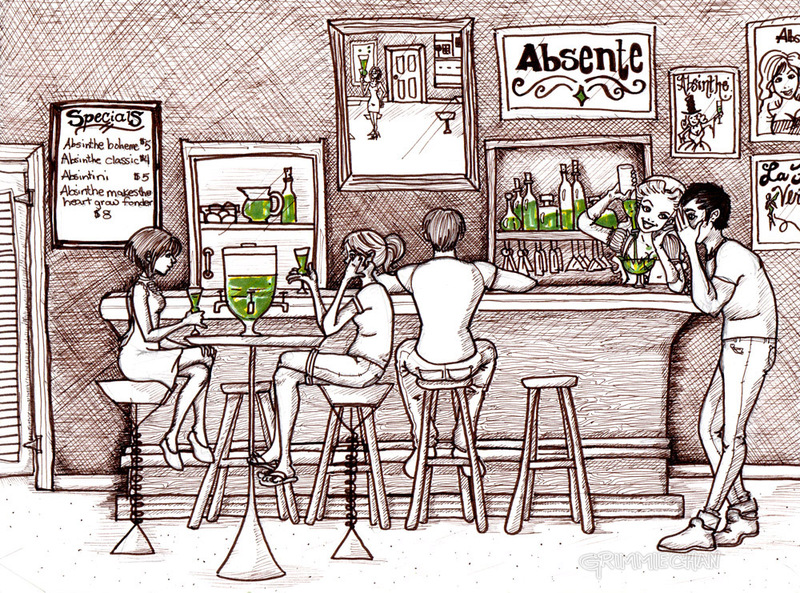 Although a fantasy bar, I know that there are actual bars that pour absinthe in the US. I wonder if any closely resemble this fantasy bar of mine.